by Mark Tushnet. New York: W. W. Norton & Company, 2013. 352pp. Hardcover $28.95. ISBN 978-0-393-074344-7. Editor's note: When first posted, this review made several references to a lack of evidence and citations. Professor Tushnet notified the reviewer and the editor that IN THE BALANCE is properly sourced. This review has been corrected by removing language indicating otherwise. As editor, I apologize to Professor Tushnet for the mistake. I happily agreed to review IN THE BALANCE, having long admired Professor Tushnet’s scholarship, citing it in my own work and assigning it in my courses on constitutional politics. RED, WHITE, AND BLUE (1988), TAKING THE CONSTITUTION AWAY FROM THE COURTS (2000), and WEAK COURTS, STRONG RIGHTS (2009) are especially notable for providing careful analyses, original perspectives, and provocative themes with respect to American-style judicial review. My disappointment with his recent effort is thus, in part, a product of my high expectations. It is also a result of confusion over the book’s intended audience. IN THE BALANCE appears to aim for a general and less academic audience, although this is never clearly explained. Even in those terms, however, the book falls short. Readers looking for insight into modern Court dynamics would be better served by other works, such as Jeffrey Toobin’s THE OATH and Marcia Coyle’s THE ROBERTS COURT. The preface sets up the book in a promising way, contrasting the confirmation hearing statements of John Roberts and Elena Kagan regarding how judges should approach their task of deciding cases. Roberts famously advanced the umpire analogy. He pledged to senators that, like umpires who merely apply rather than make the rules, he would adhere to a properly limited judicial role and “call balls and strikes and not ... pitch or bat” (p.ix). Kagan, on the other hand, acknowledged limits to this analogy. She offered a richer notion that, while judges’ decisions are “law all the way down,” they are not products of a “robotic enterprise” and they inevitably require the exercise of judgment (p.x). These competing views, as well as tensions between the two seen in Kagan’s appearances before the Court as Solicitor General, foreshadowed what Tushnet currently observes as a contest between Roberts and Kagan over the intellectual leadership of the Court. There is much at stake in that fight, he claims, with the Court closely divided in partisan and ideological terms. This leads to an additional prefatory theme: while the justices are products of “the larger structures that organize our politics,” particularly “how presidents decide to lead their parties and how interest groups affect nominations and litigation,” they are also “authors” who implement their competing “constitutional visions” (p.xii). The Court’s future path will emerge out of this delicate balance of law and politics and of principle and partisanship. Unfortunately, these interesting ideas are poorly developed in the remainder of the book. For example, while the alleged Roberts-Kagan competition to lead the Court is periodically restated, it is not explained or defended with [*6] persuasive argumentation. 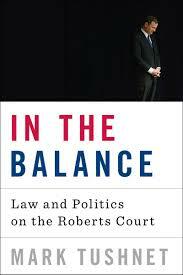 Instead of effectively elaborating on the themes introduced in the preface, much of the book consists of disconnected, unremarkable, and often poorly-written descriptions of leading cases decided by the Roberts Court. Tushnet reviews a variety of cases in Roberts’ first two years on the Court (Ch. 2) and provides chapter-length treatment of the “Obamacare” decision (Ch. 1), gun rights (Ch. 4), business cases (Ch. 5), free speech (Ch. 6), and campaign finance (Ch. 7). Chapter 5 is by far the best chapter of the book. It examines whether the Roberts Court has acted as “business stooge or umpire” and challenges existing research by noting that a simple pro- or anti-business judgment is not feasible when a case pits business interests against each other or implicates other issues like federalism or standing. Although not terribly original, at least here the analysis is effective ... and crisply written. These virtues, alas, are not consistently displayed in the remaining chapters. Chapter Four, for example, tells the truly remarkable story of how the broad consensus that the Second Amendment did not protect an individual right to gun ownership – a consensus that included Robert Bork and Chief Justice Warren Burger – was completely upended by an extraordinarily successful political movement. This story includes the lobbying and litigating activities of the National Rifle Association and intellectual developments in the legal academy advancing originalism as the only legitimate interpretive method. Tushnet explains originalism, particularly the “original public meaning” (OPM) version, and describes and critiques its ultimate “triumph” (p.185) in HELLER and MCDONALD. Compared to other chapters, this discussion is much better directed to a clear thesis. It is not, however, without its problems. For example, Tushnet intends to use this story to highlight the “structures of our constitutional politics within which the Roberts Court operates” (pp.153-154), but the three features he identifies are odd and unexpected: “the role of empathy in the choices movement lawyers make in selecting the plaintiffs in whose name their lawsuits will be brought” (p.154), “interest group maneuvering” (p.157), and “the role of the specialized Supreme Court bar” (p.159). One section of the book that is certain to attract attention is the discussion of the Chief Justice’s alleged vote-switch in the Affordable Care Act (or “Obamacare”) case. It was widely reported that Roberts initially voted with his four conservative brethren (Alito, Thomas, Kennedy, Scalia) to strike down the law, but changed his vote to uphold it in what many commentators regarded as a statesmanlike attempt to protect the Court’s reputation as a non-partisan decision maker. Surprisingly, Tushnet contends that this “view is wrong,” claiming instead that the Chief Justice “was doing law, not politics” (p.2). Roberts “expressed his best judgment about what the law as he understood it required. He called it as he saw it: one [*7] ball and one strike” (p.21). (I assume, but am not certain, that upholding the law as a legitimate tax provision was the “ball” and that the rejection of the government’s commerce clause justification was the “strike.”) This argument takes some time to develop. Tushnet begins with the prevalence of decision-making fluidity on the Court to claim that Roberts “probably never ‘changed’ his mind, but rather ‘made up’ his mind” (p.21); he merely substituted a firm and final decision for his initial tentative vote. This seemed to me like a minor semantic difference and hardly worth the effort of constructing the argument. I thought the same was true regarding Tushnet’s conjectures (“[h]ere my speculations are rather less grounded” (p.24)) about how Roberts might have assigned various parts of the majority opinion to other justices. An interesting part of the argument comes at the chapter’s end. Tushnet suggests that Roberts followed the Republican view on Congress’s commerce power to which he had firmly committed himself in the Reagan years, but supplied a plausible tax-power argument to uphold the statute consistently with his earlier practice of allowing majorities to prevail where the law, and his party’s view of it, was less clear. The argument advanced in this chapter is quite uneven in quality and its purpose is puzzling. Why is the “Roberts as statesman” view so objectionable, and why work so hard at constructing a counter-argument, especially when Tushnet admits that his views are based mostly on guesswork? My main substantive complaint about the book is the frequent failure to provide elaboration to support its claims, particularly when they express unusual or unexpected viewpoints. For example, I was surprised by Tushnet’s assertion, which seemed to come out of nowhere, that Justice Alito was “exactly right” (p.224) in his dissenting view in SNYDER V. PHELPS that innocent families should not have to pay for society’s commitment to open debate by enduring the offensive protests by the Westboro Church at military funerals. And I was shocked by his suggestion that the Roberts Court’s vigorous protection of free speech (“[i]f the First Amendment had a Facebook page, the Roberts Court would ‘like’ it” (p.215)) can be partially explained by the justices’ desire for good press. After all, he says, “newspapers … are sanctimonious about the First Amendment’s sanctity” and “a justice is going to get more praise than criticism from newspapers and commentators for upholding a First Amendment claim… And justices being people, they’d rather get praise than criticism” (pp.234-35). I am also unsure why personal jibes against individual justices regularly appear: Scalia “play[ed] to the audience outside the Court” and “repeatedly went for sound bites reproducing common conservative talk radio lines” (pp.14-15); Sotomayor has left only a “small footprint” on the Court (p.82); Breyer raised questions at oral argument “at, as usual, great length” (p.15); Kennedy writes for “the history books” in “rhetoric [that]…could be both ponderous and pompous” (p.94); and Roberts, in his first couple of years on the Court, suffered from “‘quotability-itis’ – getting off lines for the sole purpose of seeing them quoted the next day in the newspapers” (p.146). The book additionally reports that Kagan “came to think that some of her most quotable lines had been mistakes because they injected a sharpness into [*8] her opinions that didn’t fit her image of how a Supreme Court justice should present herself to the public” (pp.146-147). How Tushnet came to learn about Kagan’s personal thoughts is never shared, although he admits in the book’s acknowledgements that he was warned by a colleague against “making insupportable claims about what one or another justice might have been thinking” (p.305). A lack of care is visible in other respects as well. For example, in discussing the 2000 STENBERG V. CARHART partial birth abortion case, the “Nebraska statute” becomes the “Kansas statute,” an error that is repeated several times (pp.129-134). After describing the “three legs” of what political scientists refer to as policy making “iron triangles” – “interest groups affected by each regulatory agency, the congressional committees responsible for agency budgets and policy, and the agency bureaucrats” – Tushnet asks the reader to “[n]ote what’s missing: someone from the executive branch” (p.57). I assume that he means someone from the White House, i.e., the president, given that “agency bureaucrats” are indeed members of the executive branch. In his discussion of the Roberts Court’s first abortion case, Tushnet only belatedly (in the third paragraph) identifies the statute as a restriction on the access of pregnant minors to abortion; the law is instead characterized as a prohibition on doctors performing abortions “on pregnant young women without notifying their parents” and further describes an exception where a judge can hold “that the woman was mature” (p.105). Several paragraphs begin with “More:” (pp.xvii, 181) or “So:” (p.101). “The journalistic tick-tock with the details of the nomination process reveals a good deal, of course, but the welter of details also conceals the structures that the daily events both reflect and create” (p.52). “Three women, one African American, one Hispanic American – the Roberts Court sort of looks like America. The ways in which it doesn’t show the contours of the nation’s contemporary political terrain” (p.96). “The Supreme Court family consists of a lot of sons- and daughters-in-law, people brought into the family because of one thing, who now have to deal with a lot of people who are there because of something else” (pp.102-103). “The language of corruption pervades campaign finance reform, but most often it’s a metonym – a word describing quid pro quos and bribery standing in for some other concern vaguely related to that sort of corruption, ranging from making it easier for large contributors to get a politician’s ear to worries about ordinary people getting turned off by a political system in which they don’t have much say” (p.252). “Independent senator Bernie Sanders of Vermont’s proposal...” (p.276). Let me conclude by sharing a recurrent thought I had while reading IN THE BALANCE. Had I reviewed this book without knowing who wrote it, I never would have guessed that Mark Tushnet was the author. The book does not consistently convey his voice, his views, or his high standards. Perhaps it did not endure the rigorous, blind peer-review process normally employed by academic presses. That is unfortunate. While I have great respect for Professor Tushnet as a scholar, social scientists will not find the rigor they expect and lay people will be better served by alternative accounts of the Roberts Court. Tushnet, Mark V. 1988. RED, WHITE, AND BLUE: A CRITICAL ANALYSIS OF CONSTITUTIONAL LAW. Harvard University Press. Tushnet, Mark V. 2000. TAKING THE CONSTITUTION AWAY FROM THE COURTS. Princeton University Press. Toobin, Jeffrey. 2012. THE OATH: THE OBAMA WHITE HOUSE AND THE ROBERTS COURT. Doubleday. DISTRICT OF COLUMBIA V. HELLER 554 U.S. 570 (2008). MCDONALD V. CITY OF CHICAGO 561 U.S. 3025 (2010). SNYDER V. PHELPS 562 U.S. ___ (2011). Copyright 2014 by the Author, Terri Peretti.